We suggest you to order this adapter cable along with our RGB converter together to avoid the the connection problem or you may customize one yourself based upon our specification. 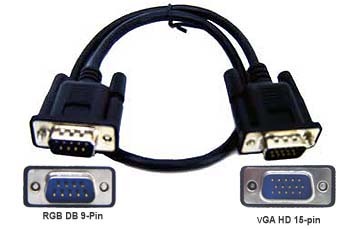 The typical legacy DB9 to HD15 monitor adapters provided from other vendors have different pin-out assignments than ours and they shall be used for connecting with IBM PS2 or NEC Multi-Sync monitors only. If you pick up one of those monitor adapters for input to our converter, the converter will not process your RGB signals correctly. If you simply use this adapter cable without going through our RGB converter (model: AV-1) for connection between your RGB device and a VGA monitor , the sync frequency will not be adjusted and result in NO Picture display on monitor. Or you may customize your own input adapter cable for your RGB device with DB 9-pin output. The following diagram shows the corresponding pin-out assignment from a DB9 RGB output to the 15-pin D-sub input of our model AV-1 converter.